Ah, it's finally October. You can dust off your favorite beer stein and head into the village for Octoberfest! Grab your beer stein and your stock up on the darkest bock beer you can find - you’re going to need it this October when you get ready for Octoberfest! And what’s better than stein after stein of delicious Märzen Bier? All of the Bavarian girls who have come to the festival! You're going to be busy talking with all of them because there's a lot of dancing to do at any Octoberfest and you're going to have to line up quite a few Fräuleins to dance with. And, you can thank this dapper costume for your full dance card - it’s sure to grab the attention of all the right people at Octoberfest or this Halloween! Experience the Old World tradition with this great costume! The 100% polyester costume comes with a cream wing-collared shirt that has a laced V-placket for extra detail. The real crowning jewel of this costume, however, is the detailed lederhosen. The lederhosen has an elastic wait for a comfortable fit and is made of brown poplin with tan edging. The pants have attached suspenders and a bib. The bib has a printed traditional coat of arms with lion and flower details. Finish off your look with the included white knee-high socks and matching brown poplin Alpine hat. 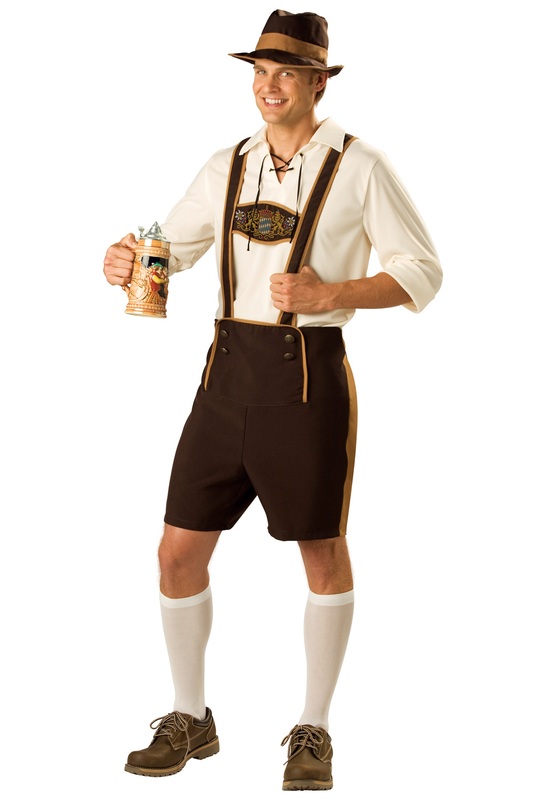 Become the envy of everyone in Germany (or your local German town) this Halloween with this traditional lederhosen costume!